Set in Melbourne in the mid-1970s, Cut Snake tells the story of Sparra Farrell, an ex-convict who is trying to make a new life for himself in a new city. He has found honest work and even becomes engaged but the prospect of this new life is challenged when his foreboding and charismatic cell mate Pommie tracks him down upon his own release. My expectations are pretty high strung whenever I encounter an Australian movie again. I was pleasantly surprised already a few times after discovering a film from Down Under. Even though “Cut Snake” put me on the wrong track at a certain moment, the film in general wasn’t really surprising. The denouement was even extremely predictable. The two main characters Jim “Pommie” Stewart (Sullivan Stapleton) and Mervyn “Sparra” Farrell (Alex Rusell) shared a grim past. That was kind of obvious. I didn’t expect those two former prisoners to have a connection on a whole different level. At first it seemed Pommie had traced his partner in crime just to convince him to pick up the thread on a criminal level. As it becomes clear that Sparra has chosen to walk the right path, this throws a spanner in the works. Sparra has resolutely opted for the ordinary life with his fiancee Paula (Jessica De Gouw). Even a poorly paid job can’t convince him to go back to a world of crime. What follows is a complex and tumultuous love triangle. 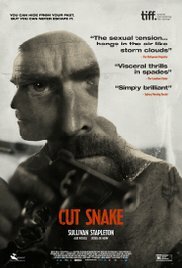 It’s safe to say that “Cut Snake” is a melodramatic thriller. What certainly stands above the rest in this film is the acting of Sullivan Stapleton. Pommie is the type of figure who makes you feel a little uneasy instantly. A burly, heavily tattooed and intimidating appearance whose uncontrollable rage suddenly breaks out and then quickly disappears. Unerringly if unwittingly, Sparra is sucked into a destructive spiral of aggression and violence. And he himself will end up in an inner conflict. 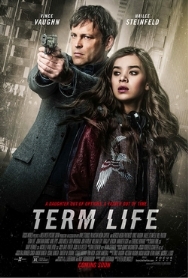 Even though it appears from the outset it’s heading for a typical crime film, the movie makes an unexpected twist, changing it into a very different mood. In contrast to the terrifying face of Stapleton, Alex Rusell has an angelic face. An ordinary guy who appeared out of nowhere in Paula’s life and whose dark past remained hidden until Pommie appeared on the scene. Something for adventurous movie lovers. The film is set in the 70s and situated in an Australian town near Melbourne. The whole film is made in the outspoken style from the 70’s. Clothing, vehicles and used soundtrack fit perfectly. My compliments to the decor department. And if you’re wondering what the film title exactly means, then I suggest you look up the Australian statement “mad as a cut snake”. “Cut Snake” is an indie with a two-faced character. On the one hand it’s a simple crime film. On the other hand it’s a rather bold melodramatic love story. The twist incorporated in the film is not without a risk. An experiment where some of the viewers will have second thoughts about. I appreciated the subtlety with regard to how everything was imaged. No overly explicit scenes were being used. Not even during the violent scenes. The highlight for me was the moment the tough and resolute Pommie emotionally crashed and briefly showed how fragile and helpless he was. A strong and persuasive piece. Are you an adventurous movie lover? Then this film is really something for you. Great film. I have it as part of my gay/indie dvd collection.